The effects of metabolic syndrome (MetS) on thyroid nodules (TN) and thyroid volume (TV), especially the related gender and age disparities, are controversial. In this study, we aimed to assess the relationships between MetS and TN and TV in an adult population. This cross-sectional study was performed in an adult population in Tianjin. A total of 2606 subjects were enrolled. TV and TN were measured by thyroid ultrasonography. Blood samples were collected to measure biochemical and metabolic parameters. The prevalence of TN was significantly higher in the MetS (+) group than in the MetS (−) group (P < 0.0001). MetS was independently associated with increased TN risk (OR: 1.24, 95% CI: 1.01–1.51). When stratified by gender, MetS was associated with higher prevalence of TN in males (OR: 1.38, 95% CI: 1.05–1.81) compared with females (OR: 1.02, 95% CI: 0.75–1.39). However, the interaction effect of gender and MetS on TN was not statistically significant (P for interaction = 0.94). MetS was associated with the greater risks of TN in both the <60-year-old group (OR: 1.32, 95% CI: 1.05–1.68) and the ≥60-year-old group (OR: 1.84, 95% CI: 1.24–2.73), while the OR value was significantly higher in the elderly group (P for interaction = 0.03). Additionally, TV was significantly higher in subjects with TN (β = 1.94, P < 0.0001) and MetS (β = 0.94, P = 0.0037). This study suggested positive relationships between MetS and an increased risk of TN and enlarged TV. Elderly people (≥60 years old) with MetS were associated with a higher risk of TN than younger people (<60 years old). The effect of MetS on TN was not significantly affected by gender. We gratefully acknowledge all the participants in this study along with Tianjin Medical University General Hospital for their assistance in collecting and examining the biochemical samples. We also thank the teachers and participating students for their cooperation and participation. This study was supported by National Natural Science Foundation of China (Grant no. : 81330064), Tianjin Education Committee Social Science Major Project (Grant no. : 2017JWZD35), and Tianjin Science and Technology Committee Project Foundation(Grant no. : 14ZCZDSY00022). B. 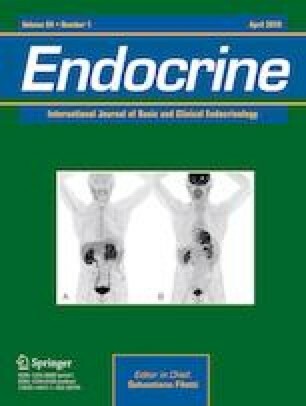 Song, Z. Zuo, J. Tan, J. Guo, W. Teng, Y. Lu, Association of Thyroid nodules with adiposity: a community-based cross-sectional study in China. 18(1), 3 (2018). https://doi.org/10.1186/s12902-018-0232-8.